Overview: The Mysore Parthenon Cohort Study is led by Dr GV Krishnaveni (Insert image G), Epidemiology Research Unit, CSI Holdsworth Memorial Hospital, Mysore, South India. It was set up prospectively in 1997-8 to assess the prevalence of gestational diabetes (GDM) and its impact on the children. This mainly urban cohort is now aged ~20 years. Objective: To study associations of GDM, maternal nutrition, newborn size and childhood growth, diet, physical activity and pubertal development with cardiometabolic and cognitive outcomes. Methods: Women were recruited into the study on booking into the antenatal clinic of the Holdsworth Memorial Hospital. Maternal glucose tolerance and plasma micronutrients (vitamins B12, folate and D) were measured during pregnancy. The children were measured (anthropometry and/or bio-impedance) at birth and every 6-12 months. They and their parents were studied in depth when the children were 5, 9.5 and 13.5 years assessing diet, physical activity, cardiometabolic risk factors and cognitive function. At 13.5 years salivary cortisol and cardiovascular autonomic responses to stress were measured in a sub-sample. 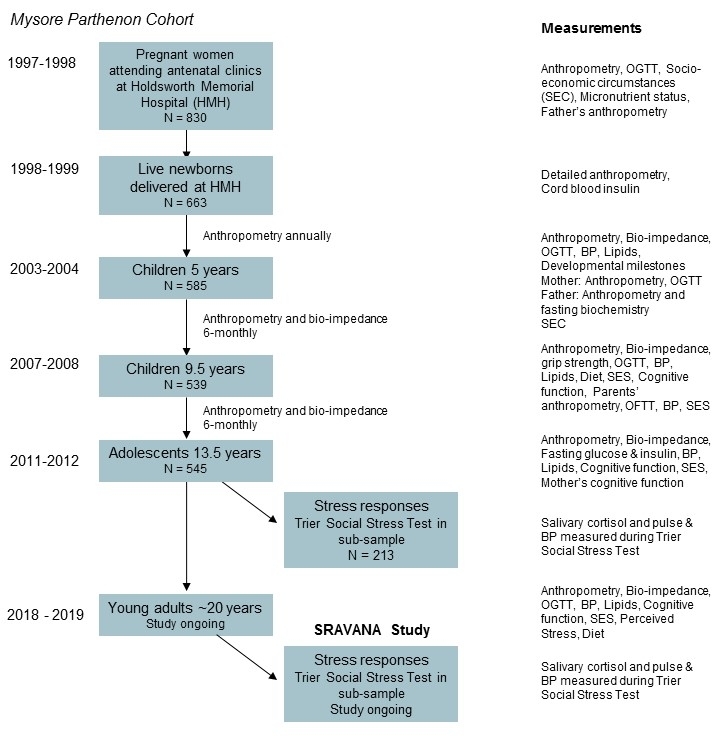 The cohort is now aged ~20 years and is currently (2018-2019) taking part in the fourth in-depth round of data collection, including cardiometabolic risk markers and stress responses (SRAVANA study). Christian AM, Krishnaveni GV, Kehoe S, Veena SR, Khanum R, Marley-Zagar E, Edwards P, Margetts BM, Fall CHD. Contribution of Food Sources to the Vitamin B12 Status of South Indian Children from a cohort recruited in the city of Mysore. Public Health Nutrition 2015; 18: 596-609. PMID: 24866058.